I think I can hit it from here! No, this isn’t Datacide, but I’d understand if you thought if it was given the header image. It is I, spikespeigel, filling in for our man this weekend as he goes out into the world to rock! Or is it punk? Hmm. 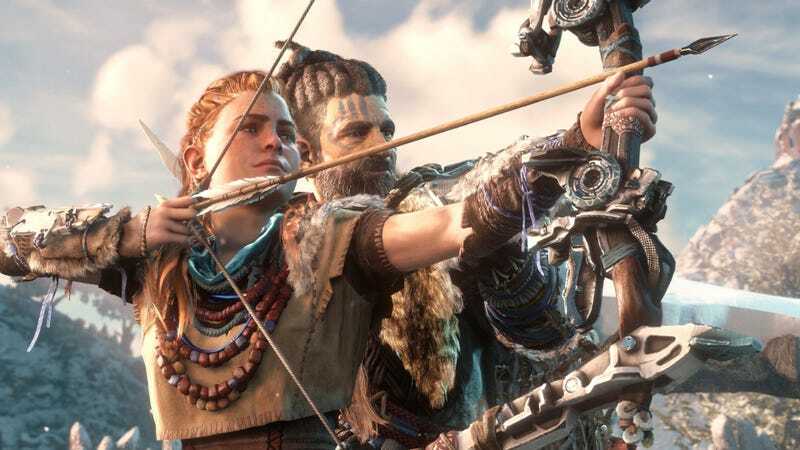 Regardless, I finally started Horizon: Zero Dawn after seeing Datacide talk about it. I’ve only gotten past the prologue, but man, this game is pretty. Still working my head around the controls since I’ve been living nothing but Persona 5 and Breath of the Wild these past few months, but slowly but surely, it’s getting there. I’m looking forward to seeing how this plot moves along, because it opens with one hell of a teaser. Alas, my vacation is over so I’ll have to pick and choose my games carefully from here on out to dedicate time to. On the horizon there’s Yakuza Kiwami for the immediate future. I’ve never played the PS2 Yakuza games so I’m looking forward to this one since I’ve played the PS3 games. Would be nice to see where the story actually began. Also, I picked up I Am Setsuna for the Switch when it went on sale so I have something other than Breath of the Wild to play on it. But other than that, I’m not really feeling this Fall’s release of games. So, I call upon all the fellow TAY’ers out there. What’s got your attention this Fall and why? Personally, I think we got spoiled earlier this year with all the great games such as Persona 5, Breath of the Wild, Nier Automata, Yakuza 0 and Horizon: Zero Dawn dropping and now the Fall looks like a barren wasteland. But maybe that’s just me.